Broccoli florets in a cheddar cheese sauce topped with red Leicester cheese. 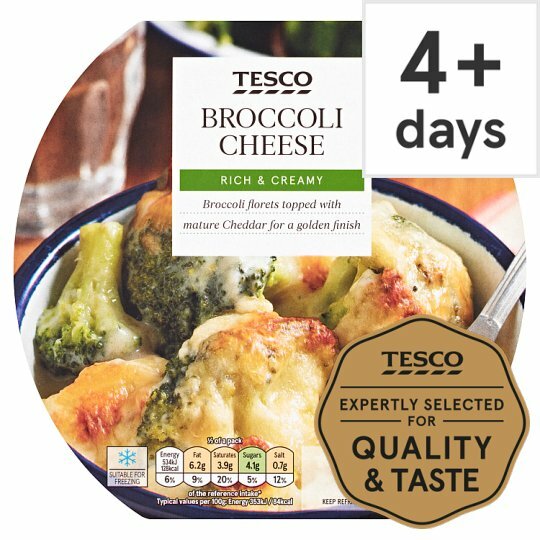 Tesco Broccoli Cheese. Broccoli florets topped with Red Leicester for a golden finish We work closely with our suppliers to deliver the very best quality and taste all year round. Broccoli (57%), Semi Skimmed Milk, Mature Cheddar Cheese (Milk) (6%), Red Leicester Cheese, Wheat Flour (Wheat Flour, Calcium Carbonate, Iron, Niacin, Thiamin), Cornflour, Butter (Milk), Salt, Mustard Powder, Ground White Pepper. Instructions: For best results, oven heat. Remove sleeve and film lid. From chilled: 190°C/Fan 170°C/Gas 5 25-30 mins Place on a baking tray in the centre of a pre-heated oven. Leave to stand for 2 minutes after heating. Instructions: Remove sleeve and film lid. From frozen: 190°C/Fan 170°C/Gas 5 45-50 mins Place on a baking tray in the centre of a pre-heated oven. Leave to stand for 2 minutes after heating. Remove sleeve and pierce film lid several times.